Even for those who only follow the media industry casually, it might not come as a shock that the Canadian newspaper industry’s revenue fell 13% over the last five years. If the industry were to look for the revenue “burglars,” branded content suppliers and conduits would be some of the prime suspects. Branded content refers to the Facebook pages, YouTube videos and mobile apps, among other digital products, that are created on behalf of a brand and distributed directly to consumers. Companies can now create their own content, distribute it, promote it and sometimes even make money out of it. So why do companies work with traditional media in the first place? 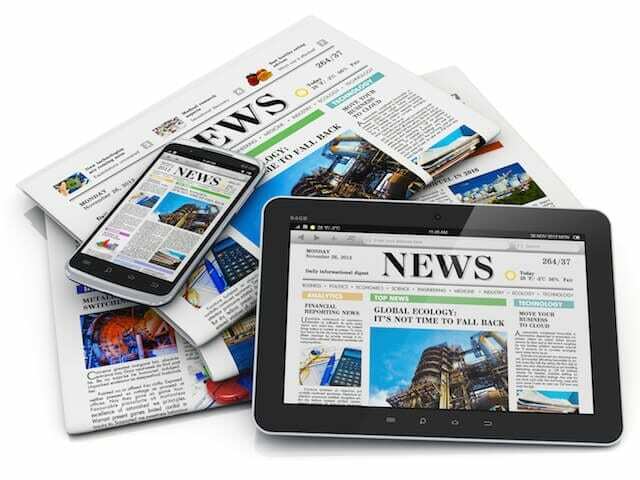 For decades, newspaper and magazine pages, morning radio shows and primetime TV were the only avenues available to connect companies with their customers. But digitization changed all of that, opening new channels for product promotion. The new media ecosystem drastically affects traditional media: in 2013, digital ad spending reached 24.6% of total ad spending, and by 2018, that number is expected to reach 30.6%. The conduits and suppliers—the Googles and Facebooks of the world—are taking an increasingly larger part of the total ad spending. But the media industry is not in its final death throes just yet. If history has taught us anything, it is that the media industry is essentially very resilient. Every time a new technology has risen, the media industry adapts and innovates in unexpected ways. For example, at the dawn of the last century, radio was expected to eliminate newspapers. Years later, TV was expected to eliminate all other media. Today, the Internet—and the plethora of web apps that proliferate on it—is forcing the media industry to adapt once again. The Internet and the digital innovations it enables are truly formidable and have kept the media industry in turmoil for years. How well will the Canadian media industry adapt? MaRS Market Intelligence decided to go to the source and find out what’s really going on inside the media industry in Canada. We talked with various digital directors from some of the biggest players in our market with the goal of understanding the magnitude of the digitization challenge and some of the solutions being implemented. We discovered that the Canadian media industry is working hard and experimenting with new digital products. Companies have deployed digital teams that are focused on offering unique digital experiences to consumers, from publishing to advertising. They are also working with startups on a variety of projects and are trying to re-define the industry once again. 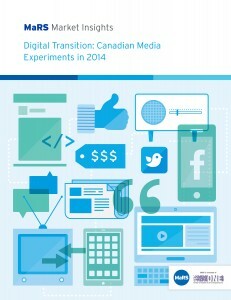 In Part 1 of Digital Transition: Canadian Media Experiments in 2014 we studied and analyzed the state of the industry. We also got a glimpse into the future of media. However, while working on this report, we recognized that in order to better understand the sector and the changes to come, we needed to take a wider look and explore the other side of disruption: startups. Interested in learning more? In Part 2 of this report, we take a closer look at the entrepreneurs who are challenging and/or changing the future of media.